My DH (dear husband), Dave, is really into miniature trains ... no, I mean REALLY into it. He has built about an eight foot square that sits at about chin height (for me). He recently added another eight foot square (3 X 3 approximately) across from the bigger one, which he is connecting with a wooden link so that the trains can go back and forth, and of course, 'round and 'round. I am fascinated by this grand work in progress. 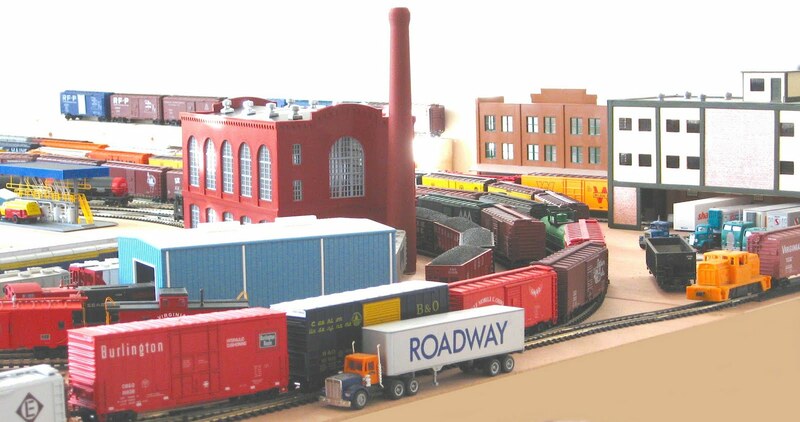 Dave has boxes of trains, train parts, miniature buildings, and cars and trucks. This definitely a work in progress. So far he has his track laid out, though he is still futzing with it a bit. He's got trains hooked up that can actually run around the track, and he has some buildings and train stations set up. He hasn't even begun to get to the trees, grass and people stage, because he is just so in love with the trains. There is no such thing as too many trains, and he continues to buy and collect more and more. He uses the HO type trains, which means his model trains are 1/87th the size of real trains. Eventually there will be tunnels and a bridge, and of course, a landscape. With his trains he is like a kid in a candy shop. That is fun! Good for him, it is great to have a hobby that you can really get into - helps keep us sane. I think I would be right there with him designing the landscape etc. Everybody should have a hobby or 2. I enjoyed checking out the cars and buildings and trucks, etc. Do they even make cattle cars anymore? or hand cars? All I see IRL here are log and lumber cars, tankers and flat beds with shipping or truck containers. Very cool. Trains sound like such a cool hobby. And it's always fun to collect something! Linda, I have passed a blog award on to you, you can pick it up at my blog.